David Packouz and Efraim Diveroli unexpectly get an arm contract that is value of three hundred million dollars, but the arm contract of three hundred million dollars brings fatal disaster for them. The story happened in a small village of ancient Japan, the hero of the story named Kubo, he has only one eye, and lives alone with his mother. 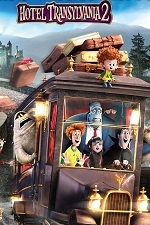 In “Hotel Transylvania 1″ Dracula’s daughter fall in love with a human boy.In “Hotel Transylvania 2″ her daughter has a lovely baby Dennis,he is half-human and half-vampire.